Believe me when I say that Dr. Stephen Hawking is my hero. And now, imagine my surprise when, this summer, my hero invited me to Cambridge University’s Research Centre for Theoretical Cosmology to talk about community access and voice output machines. Special educators hold a special place in our heart for Dr. Hawking. He is that shining example to all of us how people with disabilities have much to contribute. He has faced down a disease and continued to stretch the boundaries of mind and science. To have a couple of hours of his time to discuss advances in technology and his experiences using a talker was, to me, the height of my professional experience. As Hawking used his cheek muscle to scroll through the alphabet to type messages one letter at a time, I shared about how inspiring my students were to me. I commented on how patient he was to be able to spend so much effort to type out a single word. I told him I don’t think I would have the same patience. He smiled and said, “I have typed four books on this thing.” It was a joke, but also showed the incredible drive and stamina contained in this man. Consider the letter T is the 20th letter of the alphabet. Imagine scrolling through the alphabet, one cheek twitch at a time, to type the word “the.” Imagine the effort to type just this page. Or four books. The man is amazing. Hawking asked me to send three questions in advance so he could type up the answers at his leisure. Instead of a third question, I asked a favor: would he be so kind as to make a short video encouraging a past student, and all kids with talkers, to use their talkers no matter how difficult? Next month, I’ll be sharing that video with the student and I hope she will be as touched by the effort as I was. 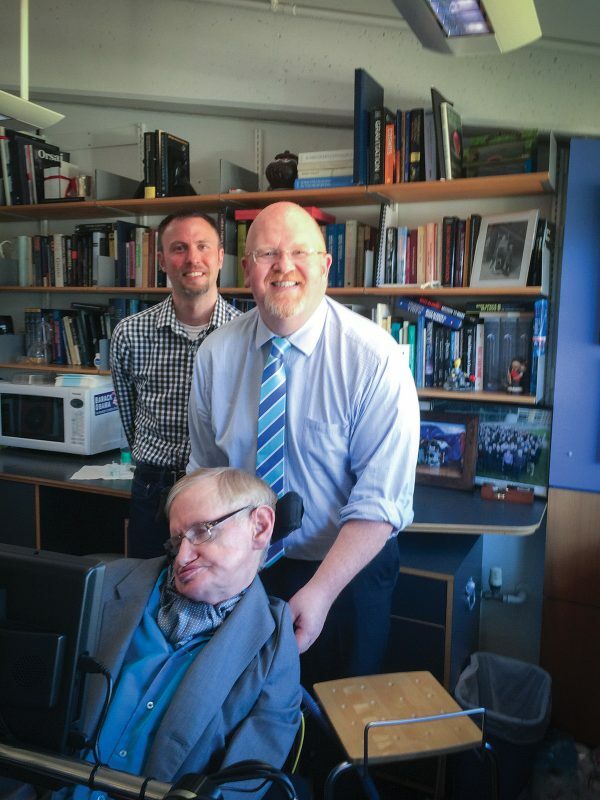 Brett Bigham, center, and his husband Mike Turay meet with Stephen Hawking in Hawking's office at Cambridge University. The meeting was certainly one of the high points of my career and the science teachers reading this are probably geeking out as well. To them, I want to share what was probably one of the most surreal moments of my life. The day I flew to Cambridge, the Washington Post ran a story about an Israeli scientist who had just proven Stephen Hawking’s Theory of Radiation. I read the article thinking how historical it was to meet Dr. Hawking on the same day the theory that made him famous had been proven. But, even as I spoke my mind was swirling around the idea that there I was trying to explain astro-physics and black hole theory to Dr. Stephen Hawking...the smartest man on the planet. How on earth did I find myself in such a situation? Hawking and his staff finally put me out of my misery and told me, “never mind, we’ll get a copy of it,” and so ended my short career in astro-physics. But, I can proudly say, on Aug. 17, 2016, I confused the heck out of Stephen Hawking. Brett Bigham is the 2014 Oregon State Teacher of the Year and a recipient of the 2015 NEA National Award for Teaching Excellence. He was awarded the Teacher Role Model Award in 2015 by the NEA LGBT Caucus and is an NEA Foundation Global Fellow. Brett is currently partnering with Microsoft Sway to create an international platform for his series of support books for people with autism and he is teaching special education at George Middle School in Portland.